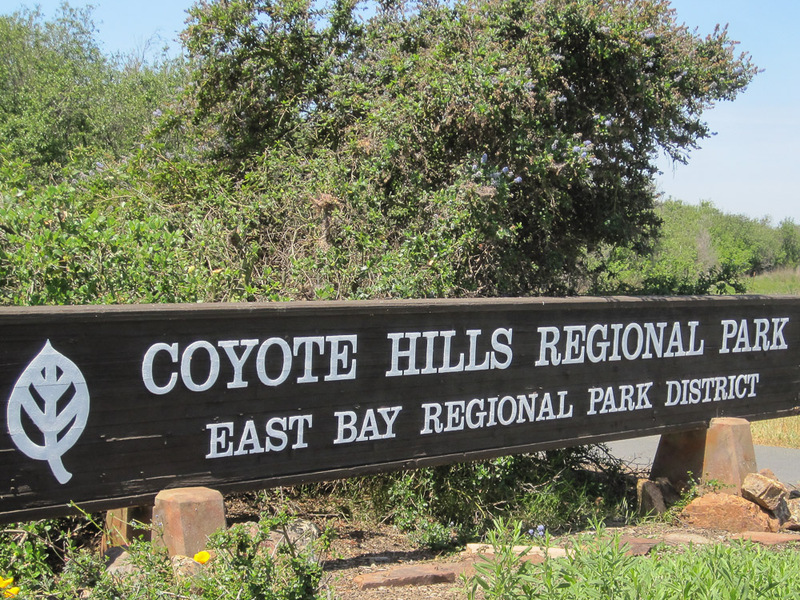 Come join us for outdoor camping fun at Coyote Creek Regional Park. Comprised of 1,266 acres of marshland and rolling grassland covered hills, this park is located along the eastern shore of San Francisco Bay, northwest of the cities of Fremont and Newark. A pack hike and fun activities are scheduled! 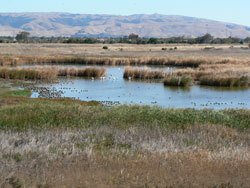 We will go to the Visitor Center to view educational displays and exhibits that portray the Ohlone way of life. This includes a tule reed boat constructed by park staff and volunteers using Native American methods. Other exhibits cover the park's natural history and wildlife. Group camping will be at the Dairy Glen Group Site. This 50-person group camp, named after the dairy farmers of the 1800s, includes three shade structures, additional picnic tables, a drinking fountain, fire pit, hand washing station, and vault toilets. Further information and a sign up form will be circulated closer to the date! For further information contact the Camping Chair, Sameer Shah. Hopefully the wonderful weather will hold and we can finally go camping! Pack families are welcome to come for the day. To stay the night, please sign up via evite so we can budget for food. The pack will provide snacks, breakfast and charcoal for the grills. You must bring your own dinner. If you want a hot meal, we recommend bringing a foil dinner to grill. Check online for great recipe ideas. Follow I-680 N, CA-24 W and CA-13 S to Redwood Rd in Oakland. Once inside the Main Entrance, turn LEFT at the Marciel Gate. Follow the road for about 2 miles and follow the signs for the Group Camping. Our Site is LOST RIDGE. Once inside our sites gate, follow the road to the Lost Ridge and park at the circle at the end of the site (see picture below). You will need a Parking Pass. Please find Jimmy Almeida for this pass. Council-organized family camps are overnight events involving more than one pack, with the local council. These weekends are fun for Cub Scouts and their families. Round robin activity stations provide structured program while leaving enough free time to enjoy the outdoors. Activities include a nature hike, games, first aid training, Scout skills, crafts, BB gun shooting and archery. There will be a campfire Saturday evening with SMORES. 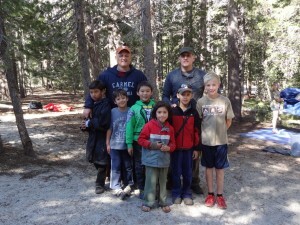 The whole family is invited to attend Cub Scout Family Camp. Anyone in the family (immediate or extended) may attend any of the Cub Scout Family Camps hosted in the redwoods of coastal California at Camp Lindblad, as long as there is one registered Cub Scout in the family. Siblings age 5 and under are only $15.00 per person, and must be accompanied by an adult. How much does it Cost and What's Covered? The registration fees below cover food, craft supplies, sporting good supplies, staff salary for positions, etc. 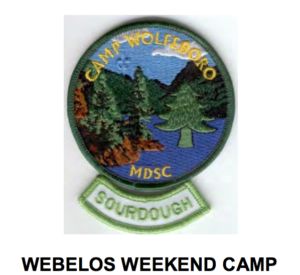 Meals supplied are Saturday Lunch and Dinner, Campfire SMORES, Sunday Breakfast and Bag Lunch Sunday Noon. (No food will be served Friday Night or Saturday morning.) Friday evening camping is available at registration site. For your convenience, registrations may be made online at our council website, http://mdscbsa.org/ . Straight to Registration Credit card payments (MasterCard, Visa, Discover, or American Express) must be made at the time of registration. You may alternately send in a check by completing the above registration online. When you get to the payment screen, next to credit card, click on the drop down menu and choose "mail in the form". 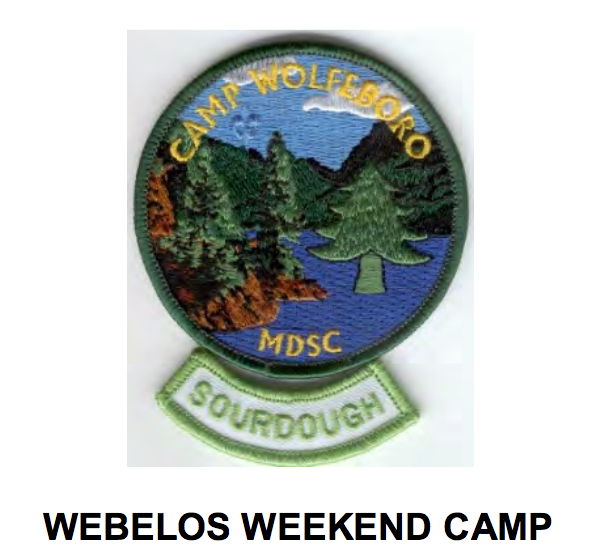 Mail to Family Camps Registration MDSC BSA 800 Ellinwood Way, Pleasant Hill, CA 94523. You will need to include payment with the form for ALL people listed on the form. Payment may be made with check, cash, or the credit cards listed in the previous paragraph. Forms will be collected at check-in. Signups for staffing needs will take place at check-in. Our October Pack Meeting will be at the Arroyo Flats Campground in Garin Regional Park. Scouts can sign up to camp overnight there after the Pack meeting. The campground has a barbecue, drinking fountain, a fire ring, and chemical toilets (we are only staying one night). The campsite has capacity for 75 campers. Signup is open now but please sign up only if you can absolutely commit to attend. Please wait if you're uncertain of your availability so everyone has a fair chance to participate. We only have a limited number of evening parking passes so we highly recommend carpooling. There are only 2 parking spots at the campground which is 1/4 mile from the main parking lot. We will need volunteers to help with logistics to shuttle equipment and young scouts to the campsite. There are also other volunteering opportunities for the pack meeting, click here to sign up. There is a trail for a group hike and a small stocked fishing pond nearby called Jordan Pond. Bring your fishing poles! Campers need to bring your own mess kits (plates, utensils, cups), and prepare your own foil dinners at home to cook in our fire pits for dinner the evening of the 15th. The pack will provide a simple breakfast for the morning of the 16th. Please use the form below to submit your interest by May 15th. We will then review the interest list and publish a list of attendees and stand-by list based on available space and volunteer hours by May 25th. Please mark your calendars. This year's highlight will be a larger campground with kitchen facilities. Restrooms are only a short walk from the campsites. Please use the form below to submit your info by March 20th. Your timely response will help us plan food, logistics, activities, costs, submit the tour plan, book the guided tour etc. to make this another great camping trip ! The cost is $40 for each adult and $30 for each youth (scout or sibling). Cost covers the site, food, some activities, belt loops, and patches. Payment needs to be submitted by April 24th. Little Basin is a unique camping destination that features open grassy meadows, acres of dense redwood forest, and miles of hiking trails as well as two sports fields, a tennis court, a basketball court, a sand volleyball court, a children’s playground, and more. The cost is $15 per person per night (i.e. 1 Adult and 1 scout staying two nights = $60). Cost covers the site, food, some activities, belt loops, and patches. If you decide to stay less than the two nights, please indicate on the Evite comments which night you are staying. Payment needs to be submitted by April 11th 6pm. Click here for a packing checklist that should help with bringing everything that you will need. We still need help with food preparation and also need large trucks that could haul large items to the camp site. Please contact Ashok Sharma if you'd like to help. This year our Pack headed to Yosemite for our summer camping trip. We stayed two nights at the Tuolumne Meadows campground. The campground is located on the Tioga Road in the east side of the park. On our first day at the park we visited Soda Springs. The Springs are located an easy hike away from the campground. The Scouts crowded around to watch the water slowly bubble out of the ground. On the hike back to camp a couple Scouts dipped their feet (and other parts) into the Tuolumne River. That night there was a camp-hosted campfire for the Scouts, another campfire where the Scouts learned about owls, and a late night of star watching for those that could stay up past 9:30 p.m. Late in the night some campers heard a bear near our campsite. Nothing went missing from our site as all our food was securely stored in the bear boxes provided by the park. There were lot's of gorgeous motorhomes and a lot of people had RV's and it made me really want to buy one! I was told that if you do a lot of travelling with your RV then it might be a good idea to make sure that your RV battery is properly fitted/charged. Some fellow camper also reccomended that if I wanted to get a Motorhome, it would be important to use a reliable insurance firm. If you are travelling around the country in a camper, be sure to check out One Sure Insurance for information on the benefits of ensuring a camper! On Sunday the Pack took a hike to the top of Lembert Dome. It was a steep, but short, hike. We took the hike with a Ranger who stopped from time to time and told the Scouts about the history of Yosemite. By the time we made it to the top of the dome we had climbed over 600 feet to an altitude of 8,800 feet. The views were spectacular! Sunday afternoon was free time. Some Scouts went fishing (no luck! ), others took in a park lecture or went swimming in the river. The water was crystal clear, not too cold and there was even a natural “water slide” the Scouts could use. The Tuolumne River feeds into the Hetch Hetchy Reservoir. The campsite had another campfire and lecture on Sunday night. Some Scouts stayed at our campsite and recovered from a day of fun. Once everyone was back at the campsite we all had s’mores. Monday morning we packed up our gear, cleaned our campsite and headed home. 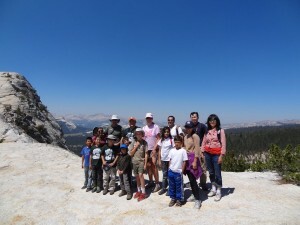 Everyone had a lot of fun, learned about Yosemite, and became more responsible Scouts. Please try to join us the next time our Pack goes camping. Come join us for some summer camping in Yosemite National Park!! Tuolumne Meadows, at an elevation of 8,600 feet, is the largest sub-alpine meadow in the Sierra Nevada. 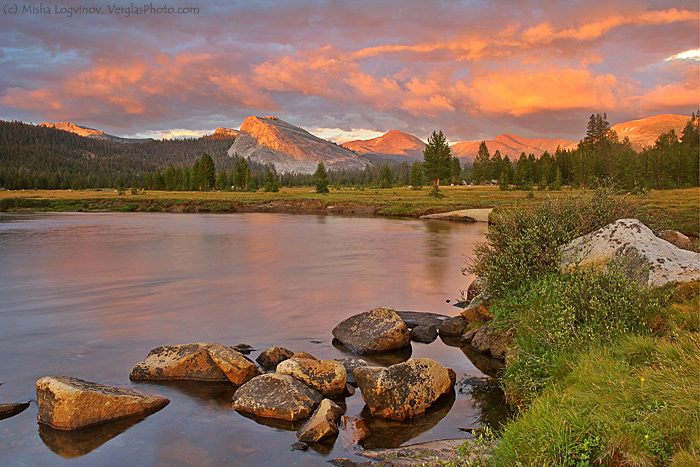 The Tuolumne Meadows area is graced by the winding Tuolumne River and surrounded by majestic peaks and domes. Spectacular in summer, the higher meadows abound with wildflowers, animal wildlife, and views of the soaring mountain ranges. There will be incredible hiking, fishing (bring your own pole) and ranger activities on top of the usual pack camping activities. The campground has real bathrooms but no showers and the average high temperature in August is 77° and the average low is 48°. The cost is minimal - $15 per person for each night staying (i.e. 1 Adult, 1 scout staying two nights = $60) which covers the site, food, and some activities, belt loops and patches. If you decide to stay less than the two nights, please indicate in the comments which night you are staying. We also encourage all families to bring their own reusable dining sets for meal times to reduce our trash and our Pack footprint. Payment MUST be received BY July 12 to secure your spots! This is to allow for proper planning and selection of helpers. No excuses please. A standard policy of No Refunds applies. We were only able to get one group site for two nights this year so we are limited to amaximum of 30 campers and parking for 5 vehicles so get your payment in early to reserve your spot. Please send (or drop off) checks payable to PACK 1776 (see Scout track for my address). Please feel free to contact me with questions via email.